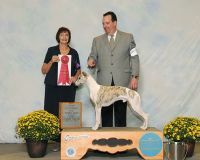 Kuma was the whippet that started it for us. Lawrence had (half) jokingly told Donna if HE became available we would take him. Look at us now. Whether in the ring, on the field, or on the couch he has far surpassed anything we expected when we brought home this little needy, demanding boy. 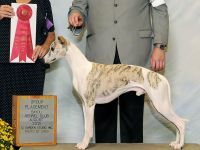 He is a multiple group placer, multiple Best in Field winner. He will be working on his C.D. in 2018, looking to add that coveted CAVX title to his name.